Alright! For this Hot Case, I’m going to share with you my love for small dark rooms filled with glowing black and white images and the occasional splash of colour. No, it’s not the latest entry for FlickerFest, it’s radiology. We all order them, and like the good doctor tells us, there’s no point in ordering an investigation if you don’t check the result. So here’s a couple to get in tune with the part of you that likes to take a punt on “Spot the ball” competitions. If you are coming up to a fellowship exam, try and formulate a structured, precise answer that uses technical medical language efficiently. You could even take turns with a study buddy. 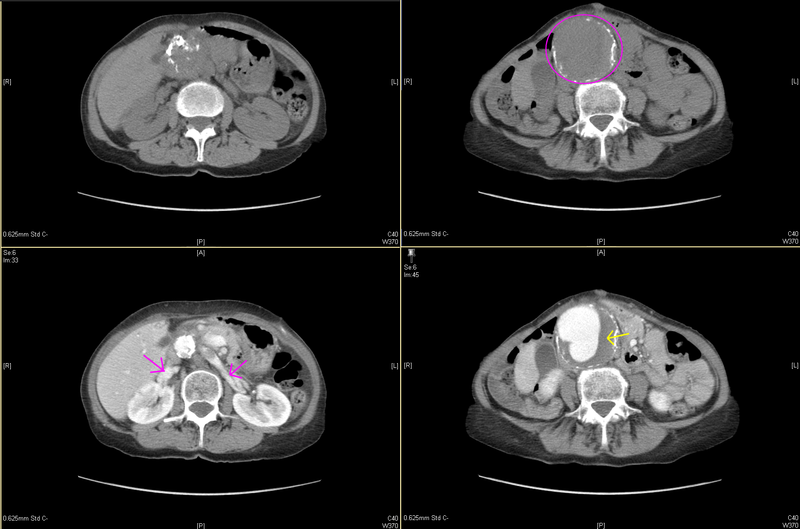 Describe the abnormalities demonstrated in these CT images. This patient began to desaturate on day 4 of their ICU admission, following repair of a colonic tear with heavy intraperitoneal soiling. What features are visible and what may be the cause of desaturation? This patient became gradually hypoxic while being managed in HDU for urosepsis. Suggest the likely cause and how was it treated? Careful! The answers are down here. Don’t peek until you’ve tried yourself. 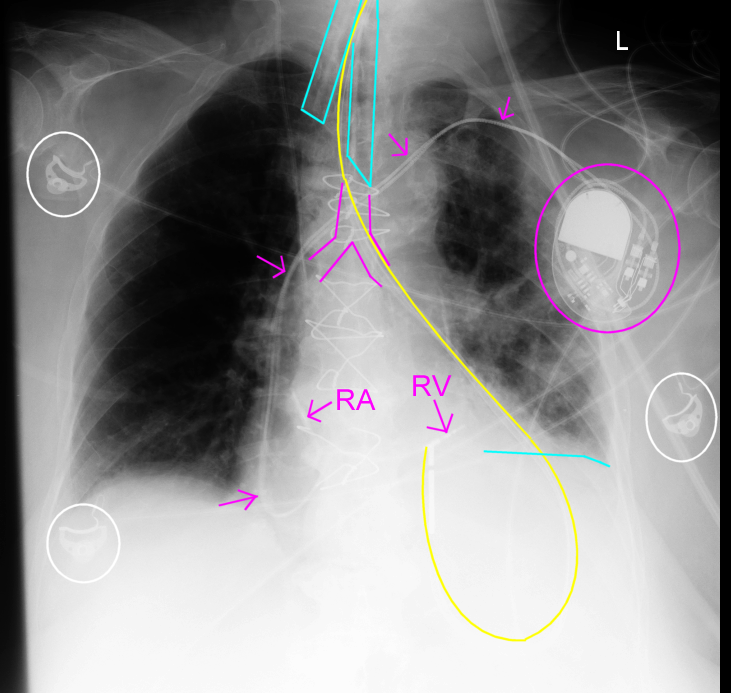 Diffuse alveolar infiltrates in all 4 lung quadrants (pink arrows), consistent with pulmonary oedema, ARDS, alveolar proteinosis, depending upon the clinical context. Partially displaced fracture through the left lateral mass of C2 vertebra in the left image (Yellow arrows. You can see the base of the odontoid peg so this must be C2). 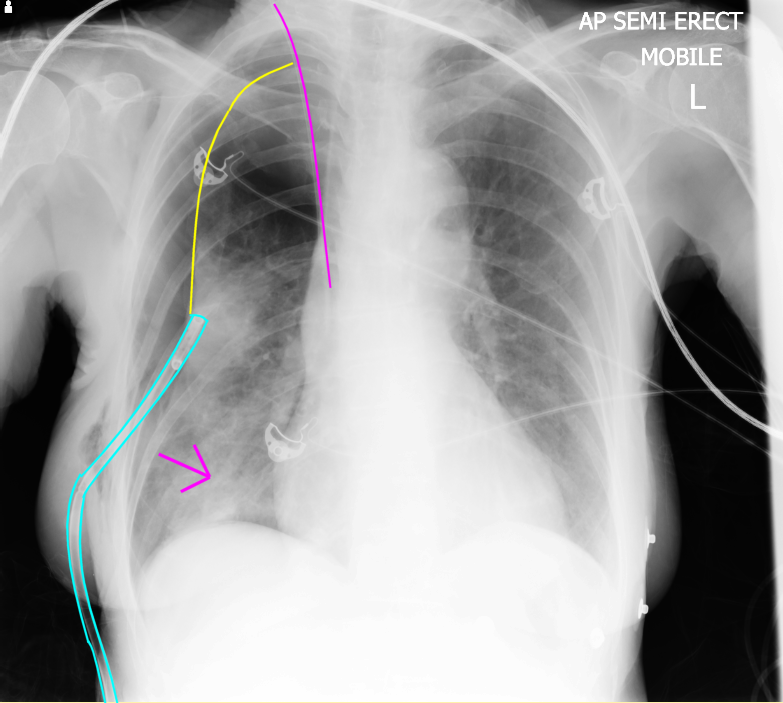 Endotracheal tube (Blue outline) – relationship of tip to carina (pink outline) difficult to clearly discern. Fine bore feeding tube passing along the left main bronchus and further distally before reflecting back in a cephalad direction (Yellow curve) ? Highly suggestive of an endobronchially placed feeding tube that has now perforated through lung parenchyma. Tip may still be in the parenchyma or now be resting in the pleural space. Sternal wires (with no evidence of a prosthetic valve ring or coronary artery bypass clips). While the right hemithorax looks quite dark in comparison to the left, there are lung markings extending to the edge of the hemithorax. The dark appearance may be related to overpenetration in attempt to visualise all of the equipment and increased left lung markings creating an apparent difference between the left and right lungs. Non-contrast images ? Large globular lesion with calcified rim (Pink circle) anterior to the vertebral column, consistent with a large abdominal aortic aneurysm (If there was a measurement scale on the image, I would estimate the dimensions of the aneurysm). No apparent acute bleed or haematoma present. No large collection of intraperitoneal free fluid. Contrast-enhanced images ? Eccentric aortic lumen with large filling defect – possibly a haematoma or atheroma (Yellow arrow). No apparent extravasation of contrast. Renal arteries are clearly seen cephalad to the lesion (Pink arrows). Suggestive of a large, intact, infrarenal abdominal aortic aneurysm. 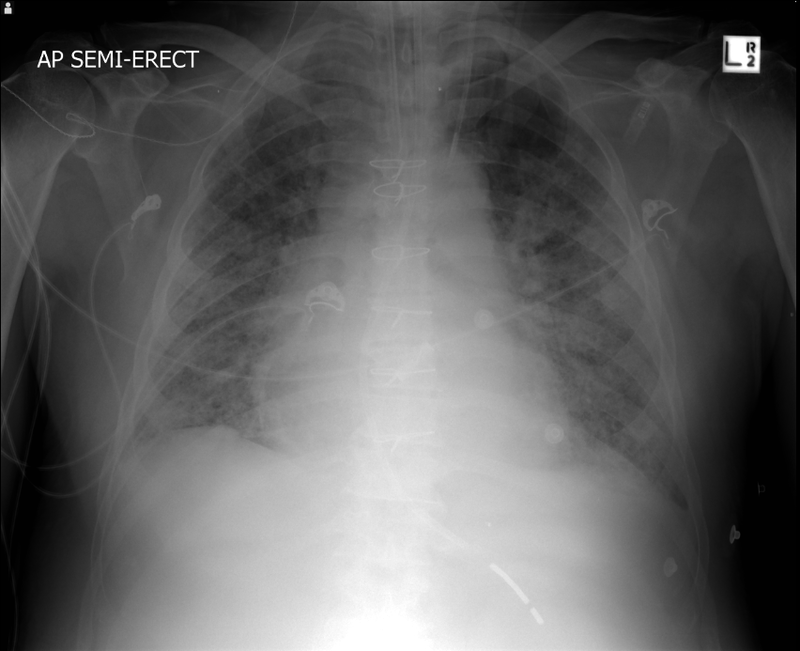 The CXR demonstrates a persistent, moderate size right sided pneumothorax (cause of hypoxia) with a right internal jugular venous catheter (likely cause of the pneumothorax) and a right small calibre intercostal catheter (treatment of the pneumothorax). If this CXR has not been performed immediately after placing the ICC, it may represent an incompletely drained pneumothorax.